Google Penalty does not mean that you should forget about organic traffic. In this post you will learn the difference between manual and algorithmic penalty and how to recover. There are two kinds of penalties for link building methods that violate Google’s guidelines. Algorithmic, also known as Google Penguin (you can recognize it only if your traffic is down or site’s visibility in Google is down and you did not receive Google’s unnatural link warning). 1. You must check if you really have been penalized. 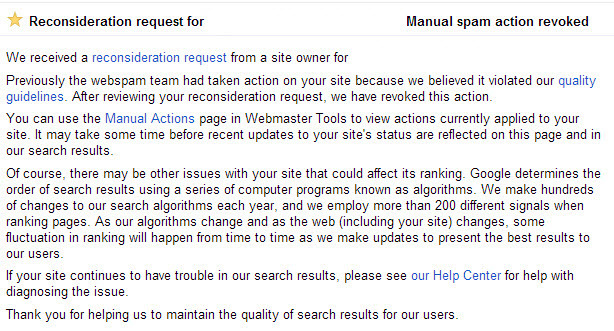 For this, go to your Webmaster Tools account and click “Search Traffic” -> “Manual Actions”. If you are under penalty, then you can find unnatural link warning message. A.) Partial Matches – “some manual actions apply to specific pages, sections, or links”. Google says that only some incoming links are affected. B.) Site-wide matches – impacts a full site. The main reason for manual spam penalty is exact match anchor text. It means that if you have a site in SEO niche, most of your anchors are “seo”, “seo serives”, “search engine optimisation”, “seo london”…ect. Today, it is not working and you have to be very careful with exact match anchor links. Both penalties, manual and algorithmic, are focused on exact match anchors. Google considers it as spam. In this section of my post, I will not be talking about the best methods to clean your backlink profile. I will do this below where I will share my knowledge about Penguin recovery. My case is very easy. Send a request to find what your links Google webspam team consider to be spam. Remove them and those that are very similar to them… send another request. If the penalty was not revoked, do the same with the new link samples. Be observant even with Google link samples. Sometime ago, they marked one my nofollow links as spam and I had to ask why nofollow link should be removed, too. They admitted the mistake. Also Dave Cain on Google Plus showed his unnatural link message where DMOZ link was marked as a spam link. As you can see, Google’s algorithms not so common, too. In each new reconsideration request you should advise what has been done, how it has been done and that your site is not violating Google’s webmaster guidelines anymore. 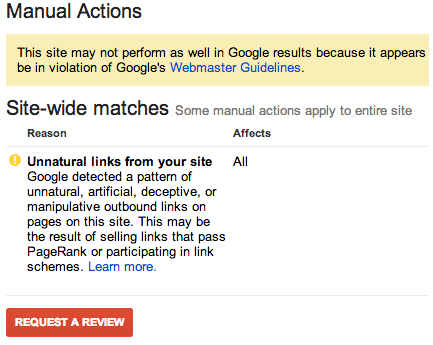 Now our site is not violating Google Webmaster guidelines. What else should we do to revoke the penalty? In most cases, you will not revoke the penalty after the first request. If you see that the penalty is still on your site after 4-5 reconsideration requests, then you will have to remove all, or almost all, exact match anchor backlinks. You can do it from the beginning, too, but as I said previously, your site rankings after the penalty is revoked will not be as good as you expected. For each new reconsideration request you need to show Google webspam team that you really did some work. Don’t send requests without doing anything on your site. All you need to do is to clean your backlink profile. As I stated above, there are two kinds of manual penalties: partial matches and sitewide matches. That is why I told you not to remove all exact match anchor links at the beginning. Very often, those links hold your site higher in search results. So, even when you are working on backlink cleaning, don’t forget to build new, natural links. 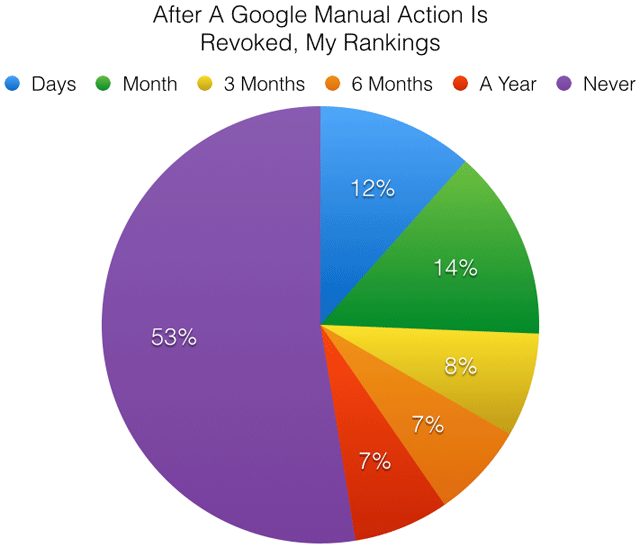 Barry Schwartz from seroundtable did a nice post about this where he asked webmasters when, after removing manual penalty action, you saw improvements in your rankings. Fifty three percent said never. No immediate recovery but improvement happens once Penguin refreshes. I completely agree with Marie. Very often, when you get a manual penalty, your site is also affected by Penguin. This is not a big surprise because they both penalize websites for exact match anchor links. My own observation: When you work with manual penalty, don’t focus on spam sites that have your no anchor link. I know that such links still violate Google guidelines, but they look natural and the Google webspam team will not ask to remove them. I guess you are all familiar with Google Penguin because it was one of the loudest updates in the latest webmaster history. 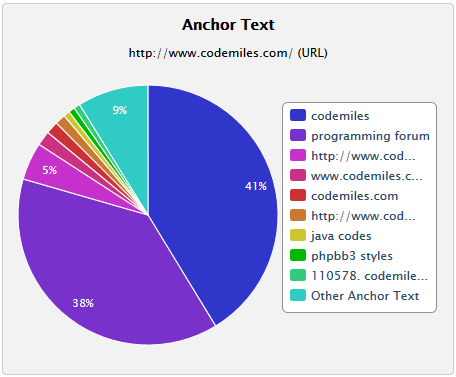 For example; let’s take a quick look at this site http://www.codemiles.com/. It is not mine and it is not advertising. I know that it was affected by Penguin from the owner’s post “I lost about 60% of my site traffic and i still don’t know what is the f**ken problem, google is just killing my site, any advices, hope an one helps me”. Majestic SEO shows more than 2,000,000 external backlinks, but 38% of all anchors are “programming forum”. Of course it was affected by Penguin. 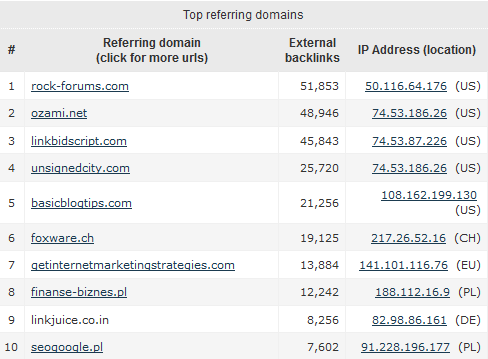 Just imagine that 38% of backlinks is 800,000. I’m sure you can’t get them all naturally. Go to MajesticSEO.com or any other service you are using for backlink analyzing. Google recommends that you use Webmaster Tools but, if you have huge backlink profile, this tool is not very comfortable because it does not separately mark nofollow and image links. 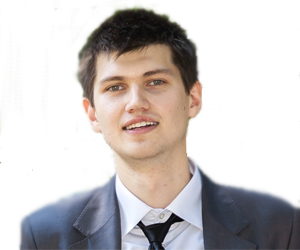 So I recommend using MajesticSEO. When you are on MajesticSEO, create a report for your backlink profile. Using our example, we should review those 38% of backlinks with exact match anchors. Click “programming forum” and you will see a list of sites with this anchor text. It will ask you to link your MajesticSEO account with your Google Webmaster Tools account. So, if you are working on Penguin recovery, you should have your site verified in GWT. Once the report is created, you can find it in “My reports” menu under your login name at the top. Note, that I do not control www.codemiles.com site, so I used my own WebmasterServe.com website as an example. Once a big part of links with exact match anchor is removed, you can expect that your site will be recovered with the next Penguin update. The main difficulty of an algorithmic penalty is that you must wait for the next Penguin data refresh to see the results. For example, if your site was affected in April 2012 and during the May-June 2012 you removed all spam backlinks, the results will be visible only after October 2012 because that is the month of the Penguin update. The last Penguin update (2.1) was on October 4, 2013. So I assume that another update will be rolled out quite soon or, at least, a small data refresh. 1. Review your backlink profile on all sites. Ask website owner directly to change your link. You don’t need to remove it completely if the site is good. Just change it to no anchor link. But, if you have many backlinks, then it is almost impossible to contact everyone manually. Improve your backlink profile by getting new quality no anchor backlinks. It will automatically reduce the percentage of your exact match anchors. 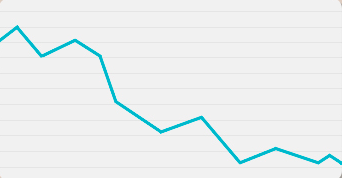 The more backlink sources you have, the faster your site will recover from Penguin. If you are 100% sure that your penalty is algorithmic, then you do not need to expect fast results. Both penalties, algorithmic and manual, focus on your backlinks profile so you have to be careful with each new link you get, especially if you have new website and your backlinks number is low. If you have been hit by a penalty, it does not mean that you should stop working on the site. Nor does it mean that you should stop getting new links. Just go about it in an informed and cautious manner and you will be fine.